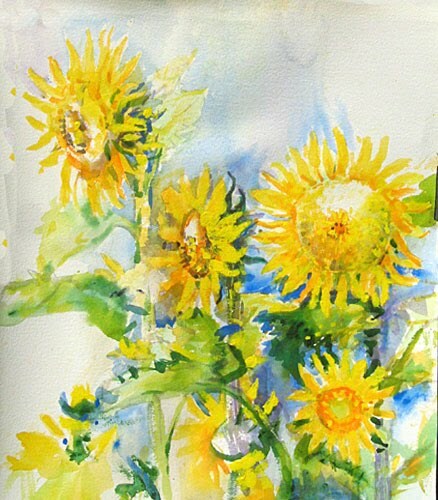 Some yellow acrylic highlights in this one, so not a totally Transparent Watercolour . Some paintings go that way & if they require you to ‘break the rules’ , then that is what must be done, as it’s picture-making first & foremost (& not some dreary, step-by-step, formulaic type of watercolour , which frankly, has more resemblance to an obsessional activity than the magic of creating a painting). I guess it boils down to listening to what the painting requires rather than a slavish obedience to rules. What is so wrong with the odd bit of yellow acrylic anyway? The sunflowers sing ‘yellow! yellow !yellow! ‘… what would they care about a painting that missed the mark & didn’t have enough yellow? Bravo on this series. It sings! this is beautiful! love the light, colors and movement. Your encouragement & feedback is important for me.